Pema Chödrön (born Deirdre Blomfield-Brown July 14, 1936) is an American Tibetan Buddhist. She is an ordained nun, acharya and disciple of Chögyam Trungpa Rinpoche. 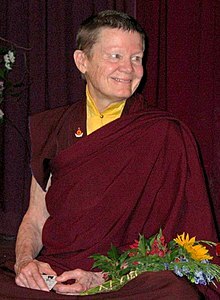 Chödrön has written several dozen books and audiobooks, and is principal teacher at Gampo Abbey in Nova Scotia, Canada. Chödrön was born Deirdre Blomfield-Brown in 1936 in New York City. She attended Miss Porter's School in Farmington, Connecticut and grew up on a New Jersey farm with an older brother and sister. She obtained a bachelor's degree in English literature from Sarah Lawrence College and a master’s in elementary education from the University of California, Berkeley. Chödrön began studying with Lama Chime Rinpoche during frequent trips to London over a period of several years. While in the US she studied with Trungpa Rinpoche in San Francisco. In 1974, she became a novice Buddhist nun under Rangjung Rigpe Dorje, the sixteenth Gyalwa Karmapa. In Hong Kong in 1981 she became the first American in the Vajrayana tradition to become a fully ordained nun or bhikṣuṇī. Trungpa appointed Chödrön director of the Boulder Shambhala Center (Boulder Dharmadhatu) in Colorado in the early 1980s. Chödrön moved to Gampo Abbey in 1984, the first Tibetan Buddhist monastery in North America for Western men and women, and became its first director in 1986. Chödrön's first book, The Wisdom of No Escape, was published in 1991. Then, in 1993, she was given the title of acharya when Trungpa's son, Sakyong Mipham Rinpoche, assumed leadership of his father's Shambhala lineage. In 1994, she became ill with chronic fatigue syndrome, but gradually her health improved. During this period, she met Dzigar Kongtrul Rinpoche and took him as her teacher. That year she published her second book, Start Where You Are and in 1996, When Things Fall Apart. No Time to Lose, a commentary on Shantideva's Guide to the Bodhisattva's Way of Life, was published in 2005. That year, Chödrön became a member of The Committee of Western Bhikshunis. Practicing Peace in Times of War came out in 2007. In 2016 she was awarded the Global Bhikkhuni Award, presented by the Chinese Buddhist Bhikkhuni Association of Taiwan. Chödrön teaches the traditional "Yarne" retreat at Gampo Abbey each winter and the Guide to the Bodhisattva's Way of Life in Berkeley each summer. A central theme of her teaching is the principle of "shenpa," or "attachment," which she interprets as the moment one is hooked into a cycle of habitual negative or self-destructive thoughts and actions. According to Chödrön, this occurs when something in the present stimulates a reaction to a past experience. Chödrön married at age 21 and had two children but was divorced in her mid-twenties. She remarried and then divorced a second time eight years later. She has three grandchildren who all live in the San Francisco Bay Area. ^ a b c d e f g h i j k l Andrea Miller (October 20, 2014). "Becoming Pema". Lion's Roar. Retrieved 2014-10-21. ^ a b "Ani Pema Chödrön". Gampo Abbey. Archived from the original on 2013-03-24. Retrieved 2014-10-21. ^ a b Susan Neunzig Cahill (1996). Wise Women: Over Two Thousand Years of Spiritual Writing by Women. W. W. Norton & Company. p. 377. ISBN 0-393-03946-3. ^ a b Haas, Michaela (2013). "Dakini Power: Twelve Extraordinary Women Shaping the Transmission of Tibetan Buddhism in the West". Snow Lion. ISBN 1559394072, p. 123. ^ Fabrice Midal (2005). Recalling Chögyam Trungpa. Shambhala Publications. p. 476. ISBN 1-59030-207-9. ^ Sandy Boucher (1993). Turning the Wheel: American Women Creating the New Buddhism. Beacon Press. pp. 93–97. ISBN 0-8070-7305-9. ^ James William Coleman (2001). The New Buddhism: The Western Transformation of an Ancient Tradition. Oxford University Press. p. 150. ISBN 0-19-515241-7. ^ "The Committee of Western Bhikshunis: Ven. Bhiksuni Pema Chödrön". Sep 17, 2006. Archived from the original on 2014-10-21. Retrieved 2014-10-21. ^ "Practicing Peace In A Time Of War". Retrieved 6 June 2017. ^ November 10, 2016 (2016-11-10). "8 North American Buddhist nuns, including Pema Chödrön and Thubten Chodron, receive "Global Bhikkhuni Award" - Lion's Roar". Lionsroar.com. Retrieved 2016-12-10. ^ Staff Writer (Interview). "Oprah Talks to Pema Chödrön". Oprah.com. Harpo Productions. Retrieved Dec 1, 2015. This page was last edited on 27 March 2019, at 19:24 (UTC).